Winston Churchill allegedly said history “shall be kind to” him as he intends to write it. While the quote is not quite accurate, he not only made history, but wrote it. However, Churchill has not been the sole author his history or others’. Plenty of ink and keystrokes have gone into to biographies about the United Kingdom’s most significant modern Prime Minister, adding nuance while ferreting out apocrypha. The same cannot be said of Springfield. There has been precious little accessible historical scholarship about the city since the New Deal. That leaves the record to history’s first drafts (i.e journalism), popular memory—read: nostalgia—and the rhetoric of politicians. The last of these must not define Springfield’s historical record, especially as a new era begins with the opening of MGM. The texture and complexity of Springfield’s situation today and its post-opening future must be properly understood as the region moves forward. Politicians’ often self-serving narratives, especially, but not exclusively about the casino cannot be the last word. To allow such all but assure history in the commonwealth’s third city shall repeat itself. Though not the sole case, our example today is the rhetoric around the casino. MGM’s six-story rise is presented, often by Mayor Domenic Sarno, as proof Springfield is rising from the wreckage of the tornado. “From the storm rises a phoenix,” Sarno said at MGM’s topping off last year. While the tornado did hit the surrounding South End particularly hard, this “version” of history misses much. It elides systemic and confounding issues hampering the city in the last 10 years while ignoring the forty years of struggle before the June 1, 2011 cyclone clawed the cityscape. We need the fullest picture of our city’s history, not just the expedient ones. Using Churchill as an example, he was a hero of history and led Britain, arguably to it finest hour. Yet, he was also an imperialist, defending the subjugation of the empire’s people with devastating results. We can and should fete him, but with recognition of his flaws and sins. The problem with pairing the casino and the tornado is that the connection is at best tenuous and superficial. First we must clarify a few things. Even if you agreed with the late Antonette Pepe that Sarno took too much credit, the city’s response, led by the mayor, was quite good. It was not perfect and its failures are largely unexplored. Yet, for a city weighed down by poverty and underfunded city services, it performed well. Its financial team ably channeled federal relief into projects that would otherwise still be on waiting lists. Then there is the human cost. Hundreds of people were permanently displaced from their homes. Many, lacking insurance lost everything. Their bounce back—or not—is an underappreciated story, too. 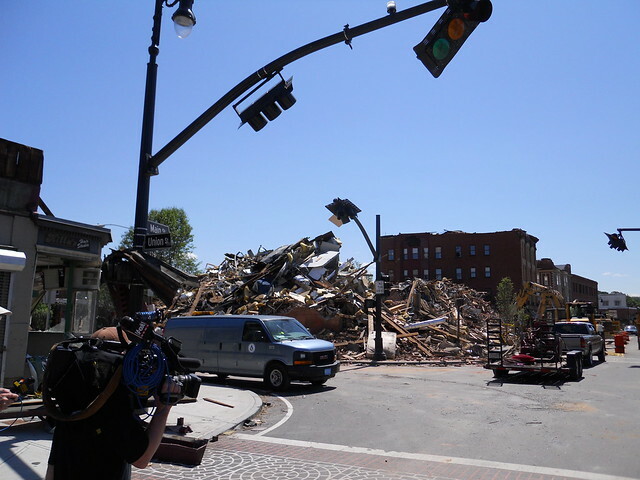 As for the South End, the damage inflicted was severe. However, what the tornado left in its wake was really an allegory for the social and unseen degradation metastasizing ever since I-91’s construction. What residents and businesses left on May 31, 2011 had been battered by crime, suburbanization, and deteriorating living standards and conditions. Indeed, the city had spruced up Main Street’s stretch in the South End shortly before the tornado descended and ripped that band-aid off. While the devastation strained 36 Court Street and city residents, it was surmountable. It may have looked like Apocalypse, but at no point was it ever really the end. Rather, the impact can be easily overstated because of concurrent, manmade potentially existential threats. Around the time of the tornado, Springfield was beginning to feel the worst of the foreclosure crisis’s impact. It can take up to three years before a drop—or leap—in property values begins to fully affect tax revenues—and it did! The foreclosure crisis reverberated citywide, affecting nearly every neighborhood. While the tornado outright destroyed or greatly reduced property values in its path, this was only in a narrow strip out of the city’s 33 square miles. In some case the loss was temporary. The wealthier stricken neighborhoods had insurance and eventually saw damaged and felled structures replaced. Incidentally, June 2011 was nearly three years after the US economy collapsed. Over that time, the state cut local aide deeply. Add the foreclosure-driven fall in property tax revenue and you have a municipal budget crisis. Why does this matter? It’s not about spanking Domenic Sarno. This blog does that enough (and will again). Rather, we need to properly understand the city and its problems. In centering Springfield’s fall around a natural disaster, Sarno is helping himself politically. He can raise himself up on a pedestal outside MGM and declare he brought himself back from the brink. But he is really engaging in age-old denialism about Springfield’s problems and their genesis. If the definition of insanity is doing the same thing repeatedly and expecting different results then City Hall is quite mad. It had been long before Sarno waltzed into 36 Court Street. In all seriousness, City Hall’s problem is not madness, but perspective and knowledge. Local media have largely failed to provide in-depth context and there is scant academic follow up. Nor do publishers release largely unillustrated books about Springfield these days. In another time, WGBY filled that void, but its in-depth local documentaries are increasingly infrequent. Instead Springfield’s systemic issues go, not ignored, but inadequately addressed. But no matter! There’s a monolith along Main Street that, like many before it, is certain to reverse Springfield’s fortunes. Make no mistake. This is not a case against MGM, either. It’s nearly here and its success, however skeptical this blog may be, will be good for Springfield. That does not mean residents and leaders can stare into its bright lights in awe, ignoring the nuance that birthed this modern city on the Connecticut. We suspect some alleged Springfield boosters will cynically condemn this admonition as the pessimism of grumps. Okay, guilty! This blog is prickly, but it is also realistic and eyes history carefully. When people misstate or outright lie about how Springfield got here and what that path indicates, we do a disservice, not just to history, but to ourselves and our neighbors. Springfield can only grow and thrive again when it honestly reckons with its with its demons, its history and its issues. That process does not fit neatly into a ribbon-cutting speech. But if we skip it, we’ll be here again with nothing to show for it, except the wags proven right once more.